Brinjals / Aubergines /Eggplant is a vegetable that can be prepared in a variety of ways. It is excellent when grilled, stuffed, roasted, sautéed, puréed or served in soups or stews. It can also be used to make curries, stir-fries and kababs. Eggplants offer endless possibilities to try something different this year and in years to come. Brinjals / Aubergines /Eggplants offer endless possibilities to try something different now and in future too. Naturally low in calories, fat and sodium, Brinjals / Aubergines /Eggplant is also high in fiber and an excellent source of potassium, as well as folic acid, copper, vitamin B6, vitamin A, and magnesium. If you can’t remember the last time you ate Brinjals / Aubergines /Eggplant, this is the season for something new. As a gardener, be adventurous. Grow a new variety in your garden. As a chef, be creative. 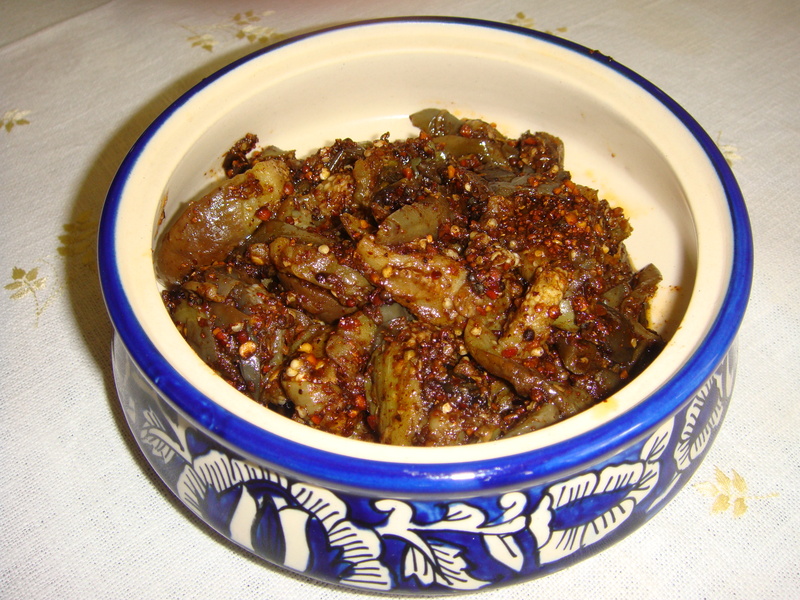 Try my new simple yet delicious recipe Brinjal / Aubergines Stir fry for your table. Heat1/2 Tea Spoon of Oil in a pan and fry White Gram, Chana Dal, Coriander Seeds, Cumin Seeds, Fenugreek Seeds, Red Chilies. Transfer the mixture into a tissue paper for the oil to get absorbed. Grind this mixture to powder and keep it aside for use later. Add remaining oil in a fresh pan. Add cut long pieces of Brinjals / Aubergines /Eggplant to the hot oil and let it cook covered on low flame. Stirring it at a regular intervals. After the Brinjals / Aubergines /Eggplant is half cooked add Turmeric and Salt. After a few minutes add the masala /ground powder/ Paruppu podi .Cook for 5-6 minutes more, switch off the stove. Serve hot with steamed rice or Indian breads of choice ! Use good varieties that have been developed of Brinjals / Aubergines /Eggplant for good flavor. The Brinjals / Aubergines /Eggplant’s flesh discolors fast after being cut so it should be used right away. If you want to cook little later cut Brinjals / Aubergines /Eggplant slices / pieces can be lightly sprinkled with lemon juice to help prevent browning. Also, slice eggplant with a stainless steel knife to avoid blackening. Brinjals / Aubergines /Eggplant is more than 90% water, the larger fruits also tend to release water when cooked. We can reduce the excess moisture by marinating the slices or cubes of Brinjals / Aubergines /Eggplant with salt for 1-2 hours. Drain, rinse thoroughly to prevent excessive saltiness, and pat dry on a kitchen towel before using. When deep-frying or pan-frying eggplant for the first time note that it absorbs high level of oil. To avoid excessive absorption of oil by the Brinjals / Aubergines /Eggplant prior to frying, the pieces / slices can be coated with bread crumbs or a flour. Several studies show that consumption of the flavonoids known as anthocyanins has played a major role in lowering risk of cardiovascular disease. One particular study revealed that those who consumed more than three servings of fruits and vegetables per week containing anthocyanins had 34% less risk of heart disease than those who consumed less. In another clinical study, researchers found that increased intake of anthocyanins was associated with significantly lower blood pressure. Research has also shown that anthocyanins inhibit neuroinflammation and facilitate blood flow to the brain. This helps prevent age-related mental disorders and also improves memory.